Recycle001 Select your background color for this recycle symbol. 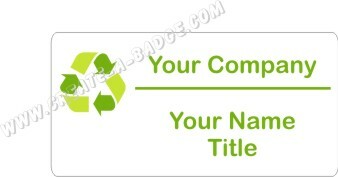 The font shown in the sample is Arial Rounded with grass green and the badge size is 1.5" x 3". Please note in the comments area of your order the background color you prefer. Recycle002 Select your background color for this recycle symbol. The font shown in the sample is Arial Rounded in medium gray. The badge size is 1.25" x 3". Please note in the comments area of your order the background color you prefer. tree001 Environmentally green... The font shown in the sample is Arial Rounded in dark gray. The badge size is 1.25" x 3". Please note in the comments area of your order the background color you prefer. Recycle003 Select your background color for this recycle symbol. The font shown in the sample is Arial Rounded in dark gray. The badge size is 1.25" x 3". Please note in the comments area of your order the background color you prefer.